MENLO PARK, Calif. (AP) _ Facebook says it will begin test flights later this year for a solar-powered drone with a wingspan as big as a Boeing 737, in the next stage of its campaign to deliver Internet connectivity to remote parts of the world. Engineers at the giant social network say they’ve built a drone with a 140-foot wingspan that weighs less than 1,000 pounds. Designed to fly at high altitudes for up to three months, it will use lasers to send Internet signals to stations on the ground. Though Facebook is better known for online software that lets people share news with friends, watch viral videos _ and view commercial advertising _ engineers in a unit called the Connectivity Lab are working on a different set of problems. For one thing, they are designing a laser communications system they hope will be accurate enough to hit a target the size of a dime at a distance of 11 miles, said Yael Maguire, director of the unit, which is responsible for drones, satellites and other high-tech communications projects. “There’s a lot of moving parts here that have to work in concert,” said Maguire, during a press briefing at the company’s headquarters. The project is part of a broader Facebook effort that also contemplates using satellites and other high-tech gear to deliver Internet service to hundreds of millions of people living in regions too remote for conventional broadband networks. Other tech companies have launched similar initiatives. 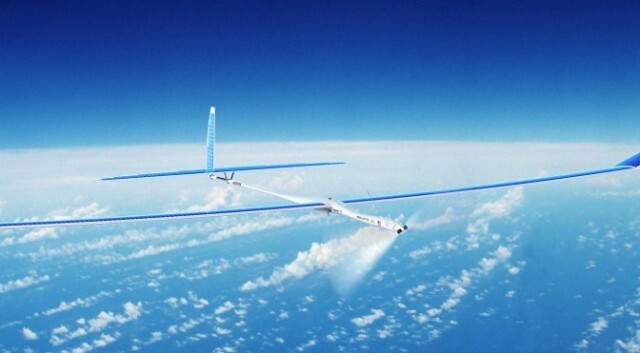 Google is experimenting with high-altitude balloons as well as drones and satellites. Microsoft has funded a project that will transmit Internet signals over unused television airwaves. Facebook also has a separate but related initiative that works with wireless carriers to provide limited mobile Internet service at no cost, in countries where residents are too poor to afford traditional wireless plans. But the company invited reporters Thursday to hear an update on its effort to provide service to about 10 percent of the world’s population who live in regions where it’s not practical or too expensive to build the usual infrastructure for Internet service. Facebook’s drone was developed in part with engineering expertise that joined the company when it acquired a British aerospace startup, Ascenta, last year. Facebook engineering vice president Jay Parikh said the team created a design that uses rigid but light-weight layers of carbon fiber, capable of flying in the frosty cold temperatures found at high altitudes, for an extended period of time. The plan calls for using helium balloons to lift each drone into the air, Parikh said. The drones are designed to climb to 90,000 feet, safely above commercial airliners and thunderstorms, where they will fly in circles through the day. At night, he said, they will settle to about 60,000 feet to conserve battery power. Each drone will fly in a circle with a radius of about 3 kilometers, which the engineers hope will enable it to provide Internet service to an area with a radius of about 50 kilometers. For the plan to work, Facebook’s engineers are also counting on a recent breakthrough they’ve made in laser optics, which Maguire said would allow them to transmit data at up to 10 gigabits per second. That’s comparable to fiber networks on the ground but about 10 times faster than standard laser signals, he said. Facebook is designing the drones to transmit signals from one aircraft to another, so they can relay signals across a broader area on the ground, he added. While Facebook has built and tested smaller prototypes at a plant in the United Kingdom, it’s looking at a site in the United States for testing the full-sized drone, said Parikh, who declined to be more specific. CEO Mark Zuckerberg has acknowledged Facebook’s business will benefit in the long run if more people gain Internet access, but he says the effort isn’t driven by profit-seeking. Instead, he has said it’s based on the conviction that Internet service can bring a variety of economic and social benefits to developing nations.